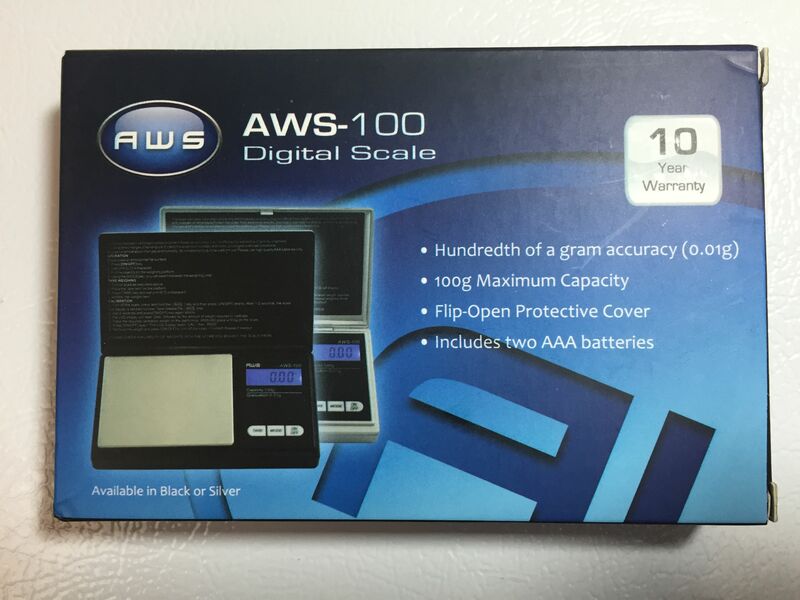 Here’s a Hands On Look at American Weigh’s Model AWS-100 Digital Gram Scale. 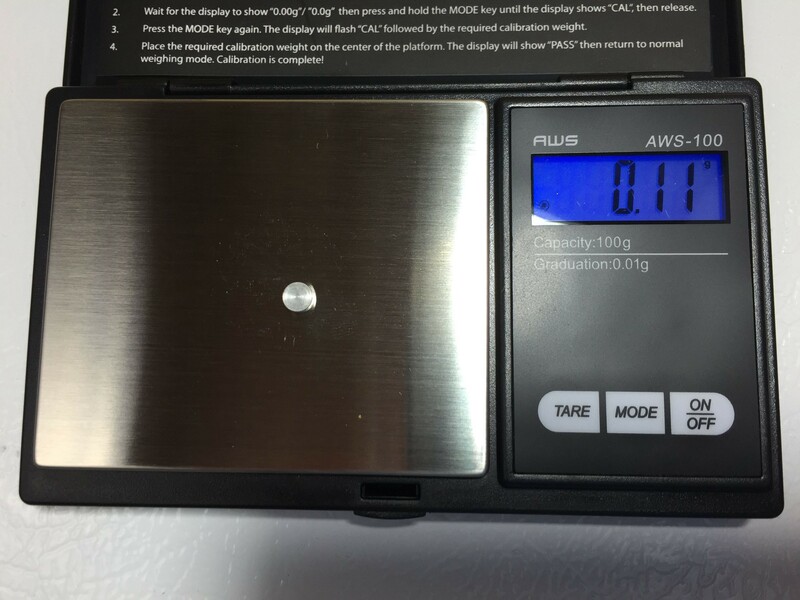 The scale has 1/100th gram resolution making it great for accurately weighing hops, small amounts of specialty grains and water salts. 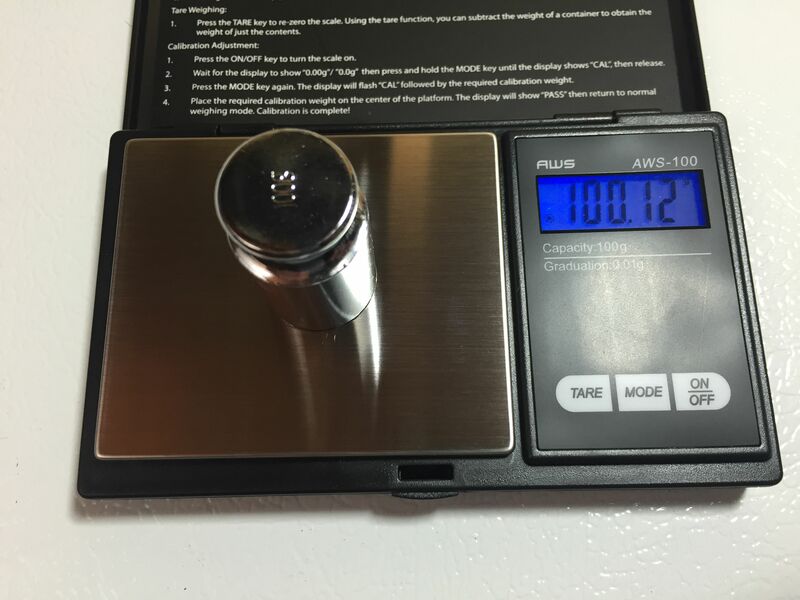 It has a 100 gram (3.52 ounce) capacity. The front of the box. 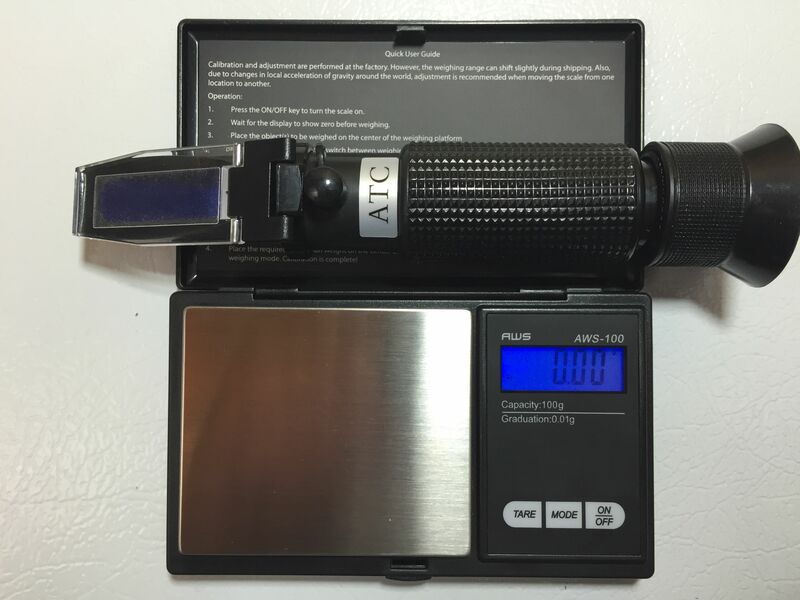 Reads: Hundredth of a gram accuracy (0.01 g), 100g Maximum Capacity, Flip-Open Protective Cover, Includes two AAA, 10 Year Warranty. Side of the box. 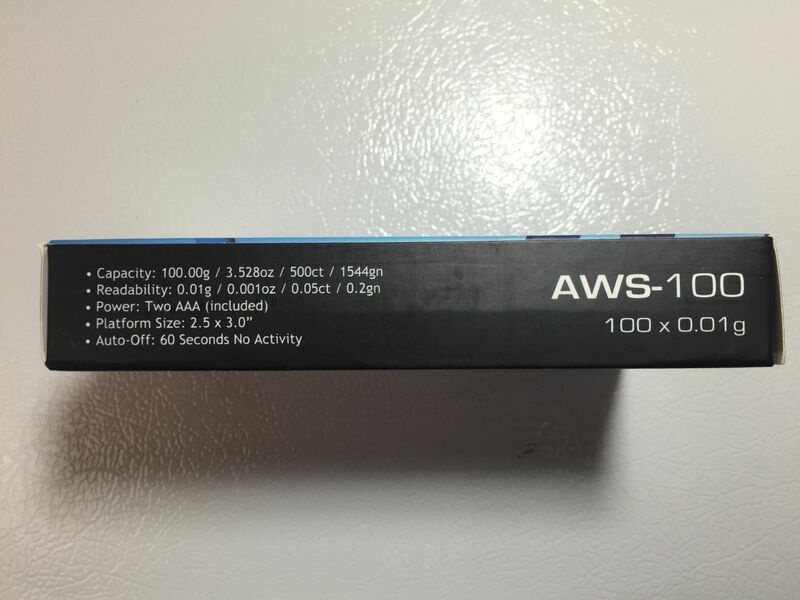 Reads: Capacity 100 g, Readability .01g, Power Two AAA, Platform Size 2.5 x 3″, Auto Off 60 Seconds No Activity. 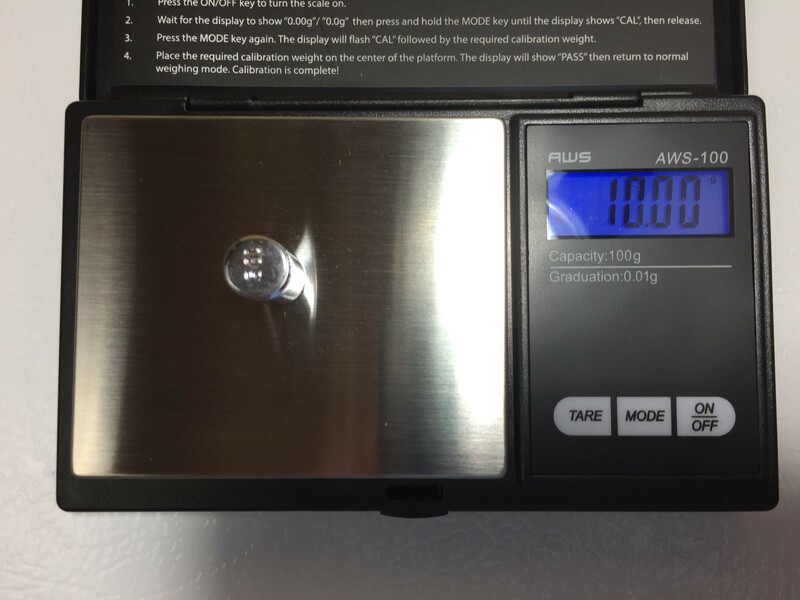 Front of the scale when closed. 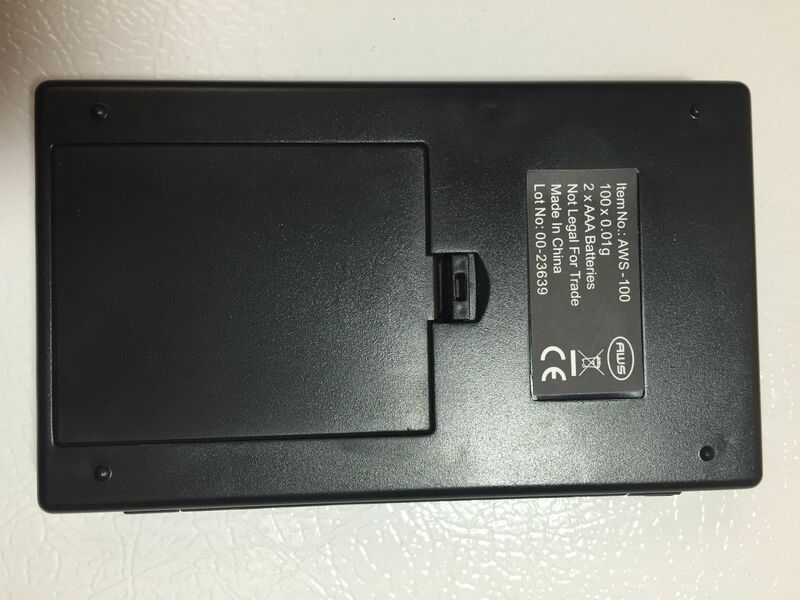 The protective cover is a nice feature. 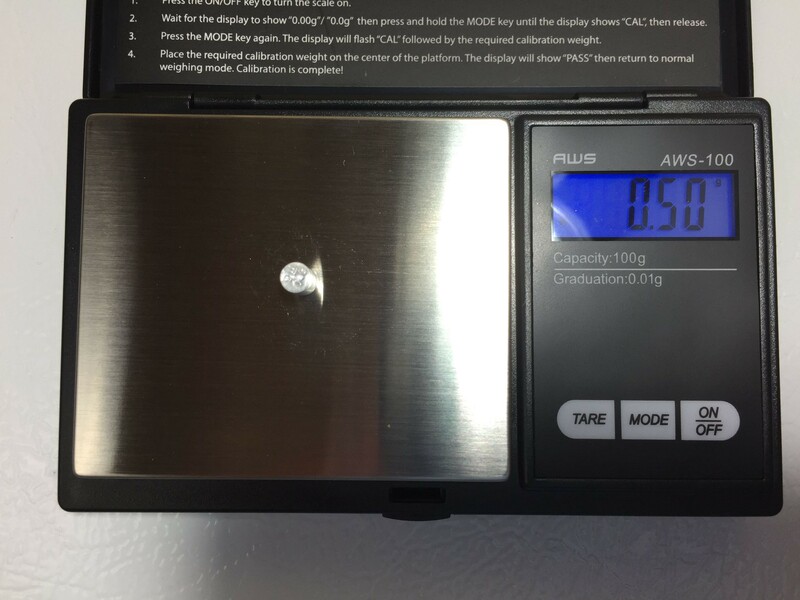 You don’t want to store a scale with any weight or pressure on the platform. The built in cover keeps that from happening. 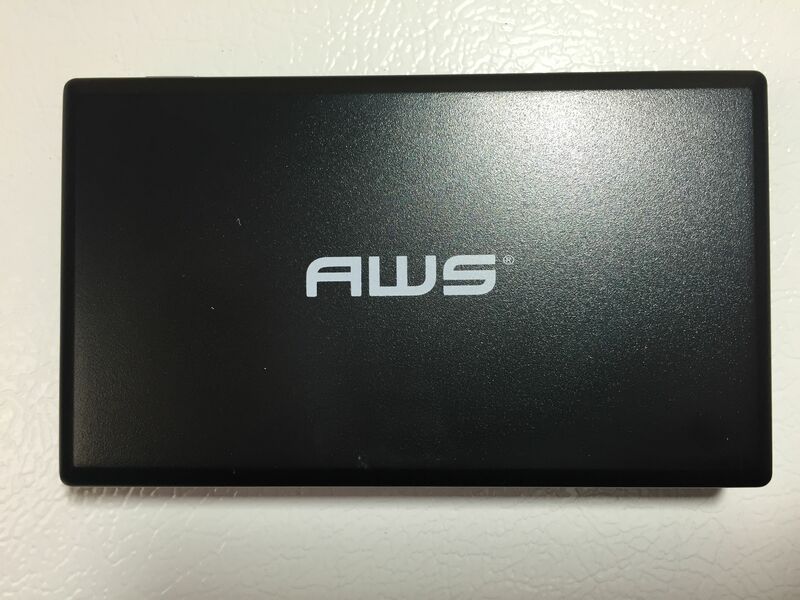 Close up of the inside of the protective lid built into the AWS-100. This includes a handy Quick User Guide. Click the picture above to zoom. 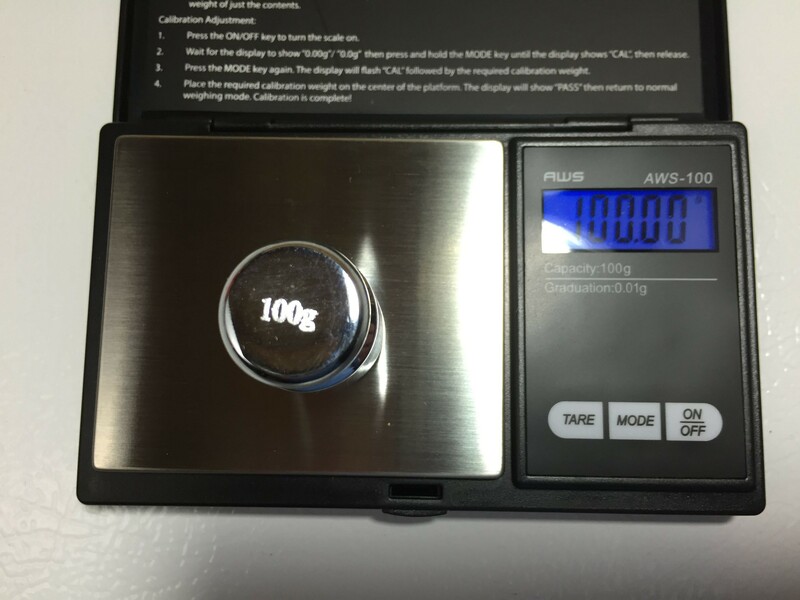 I purchased this 100 gram Calibration weight at the same time I got the AWS-100. It’s worth picking up one of these. You’ll see why next. 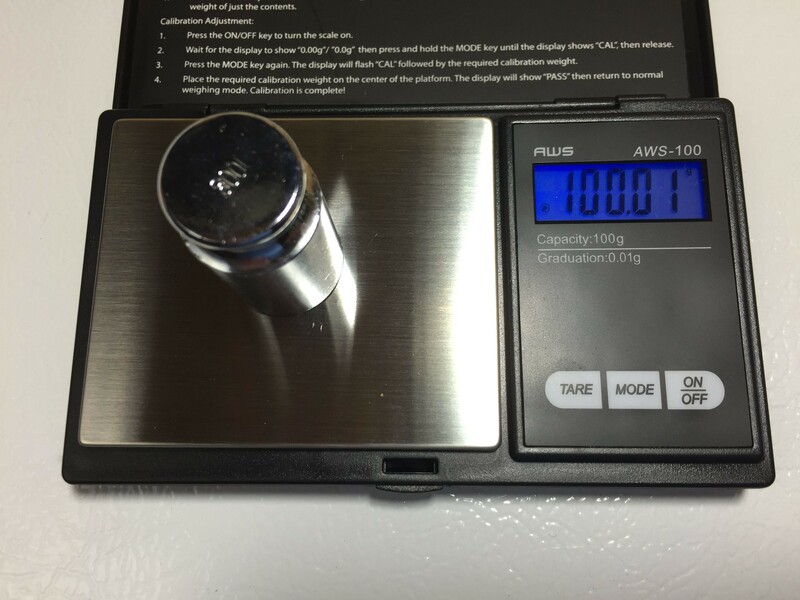 The 100 gram weight reads 100.12 grams. The manual states that “calibration and adjustment are performed at the factory. However, the weighing range can shift slightly during shipping”. 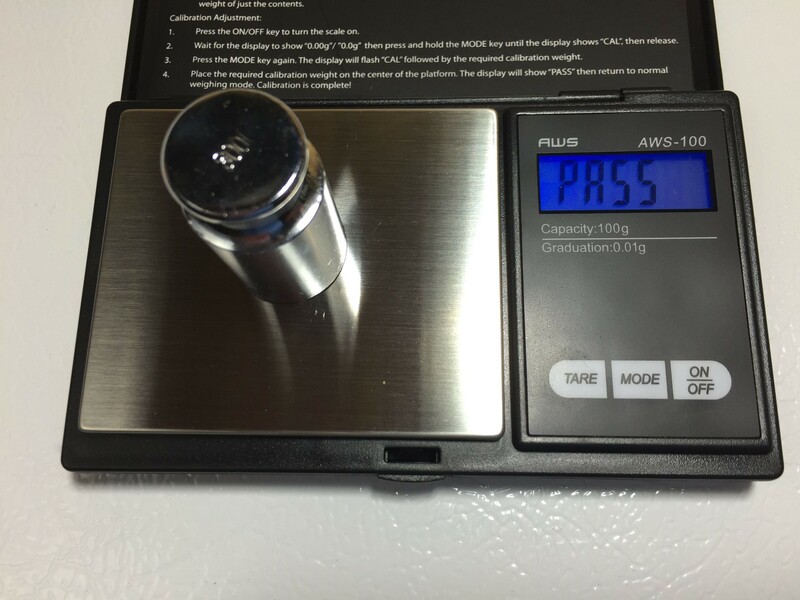 If the scale is weighing within an acceptable tolerance the scale should be left alone. If it is outside of tolerance, it should be calibrated. 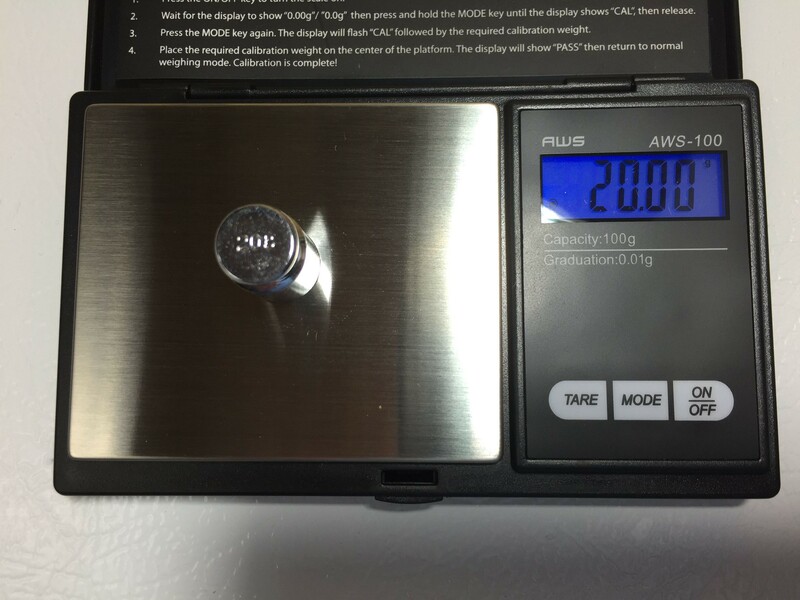 The manual says that the tolerance for this scale is .02 grams. .12 is 6 times acceptable tolerance. Calibration is required. Put the weight on and the… wait 🙂 and the scale will pop up pass. I’m guessing it calibrates itself using the weight and then re-tests the weight to ensure that it’s within tolerance. If it is… whammo… pass. 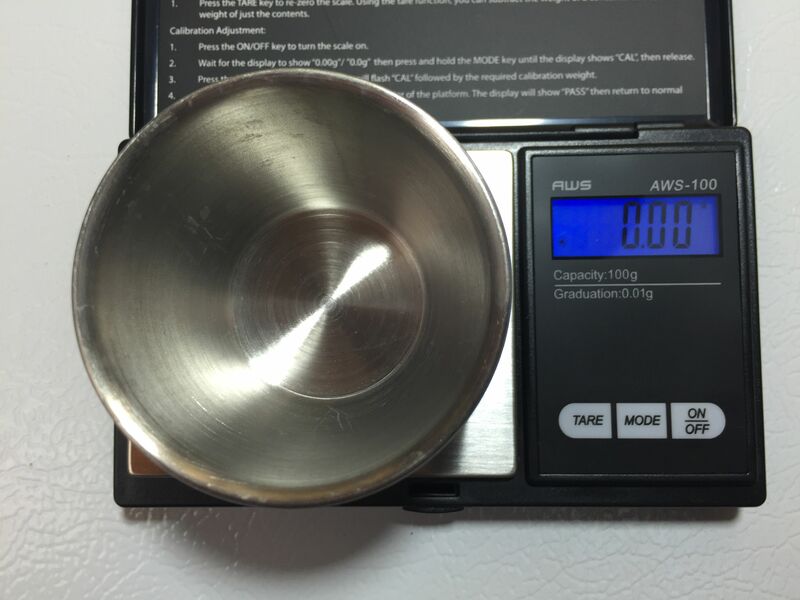 This is a different 100 gram weight. It reads right at 100. 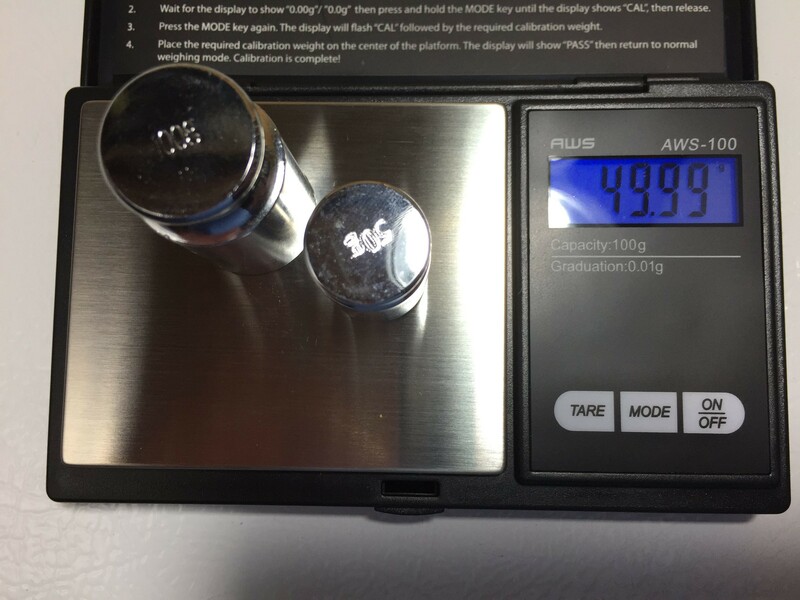 A note on accuracy: I don’t have lab quality weights. Slight variances in accuracy tests could be a reflection of either the scale or the weight or both. My guess is both are generally to blame. 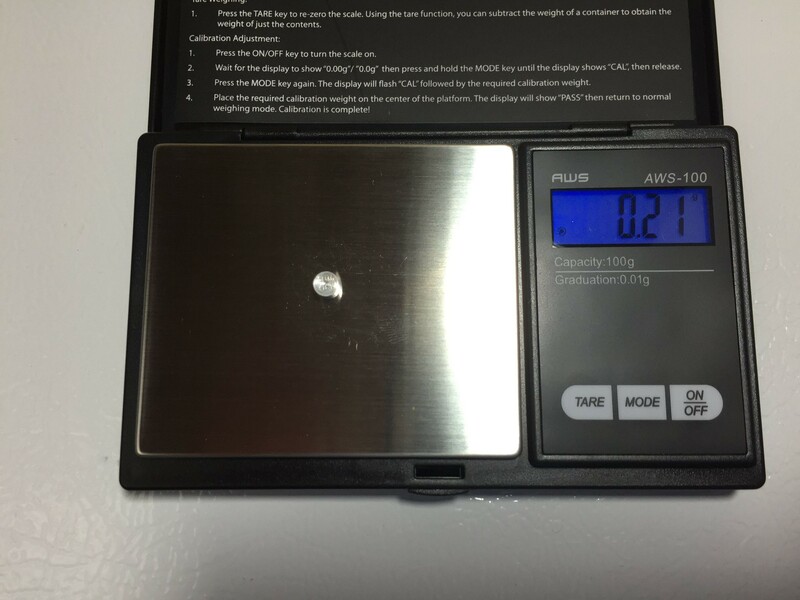 If 1/100th (one one-hundredth) of a gram is an issue for what you’re doing… you’re going to need a lab quality scale. Reads .11 with a 100 milligram calibration weight. 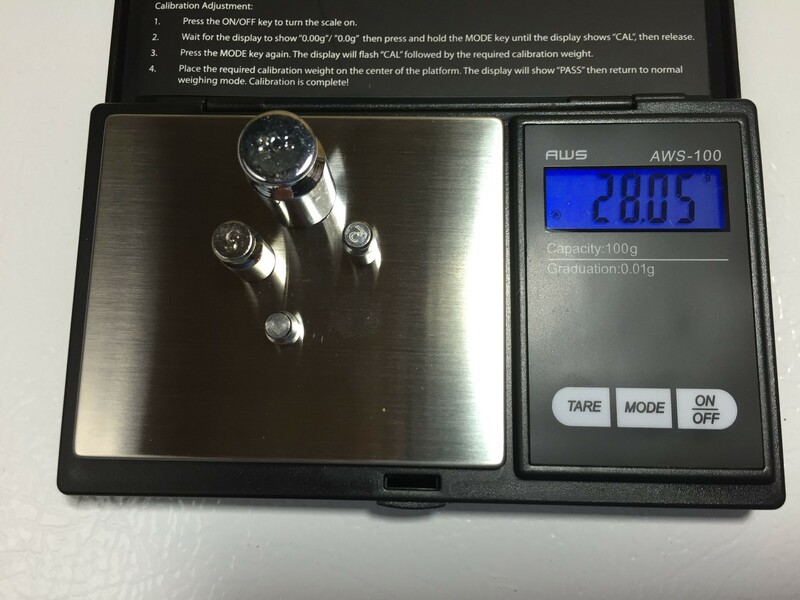 Getting a reading on this light of a weight verifies that this scale is good for both hops and water salts. It’s not really necessary (at least in my book) to get down to tenths of a gram for hops (although it’s nice to be able to do). It is necessary to get down to this range for water salts. 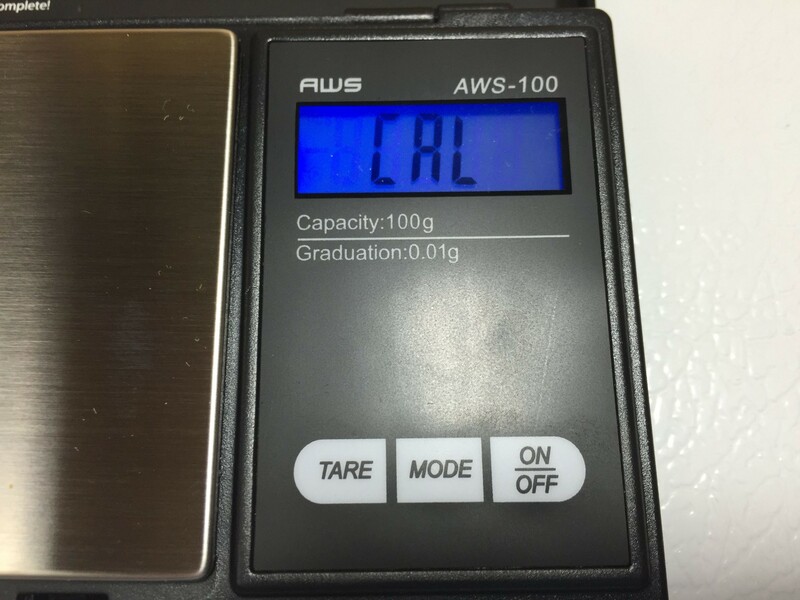 Weighing 28 grams (about one ounce) of calibration weights using the AWS-100. 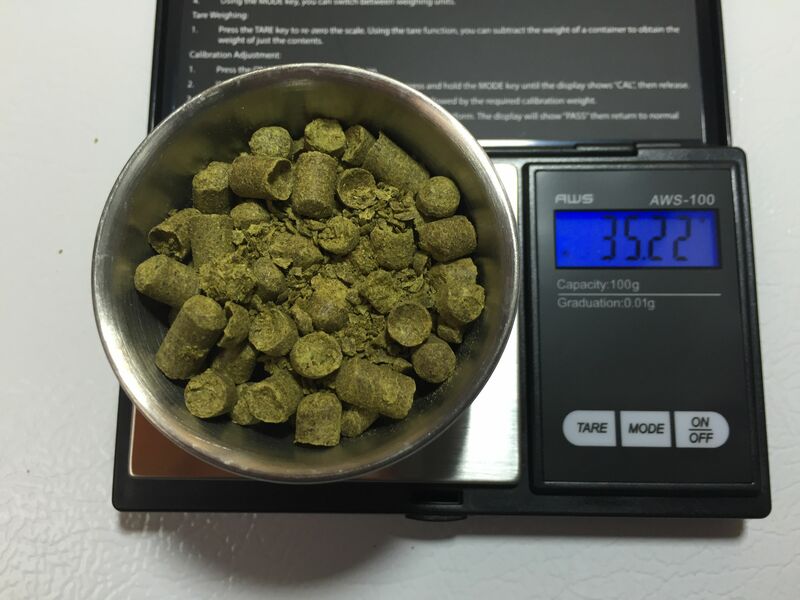 Hops and water salts are a couple of things that I like to weigh in metric. The other is… yeast starter wort. That is very easy to formulate using liters and grams. 1 liter of water goes with 100 grams DME. If you need a .5 liter starter it would be .5 liter of water + 50 grams of DME. 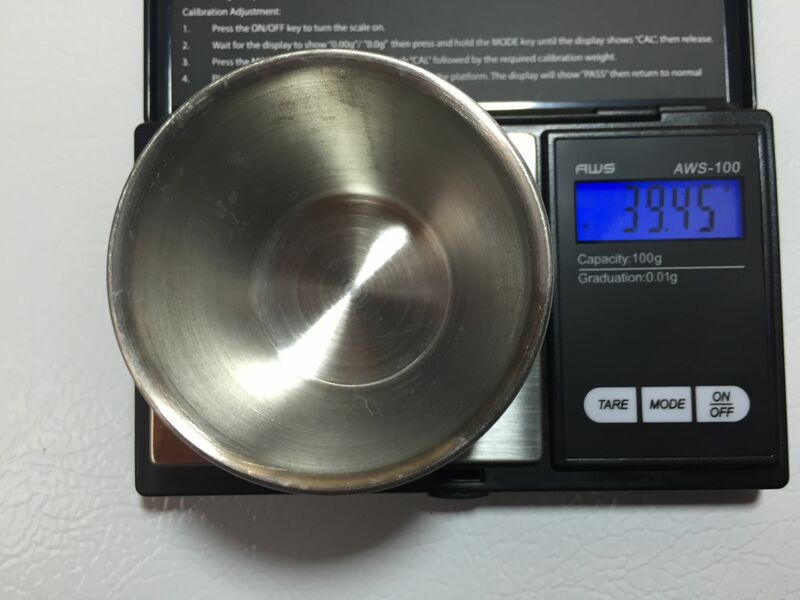 Weighing a stainless sample cup (part of my Brew Day Box). This is a good example of the beauty of the Tare Feature. 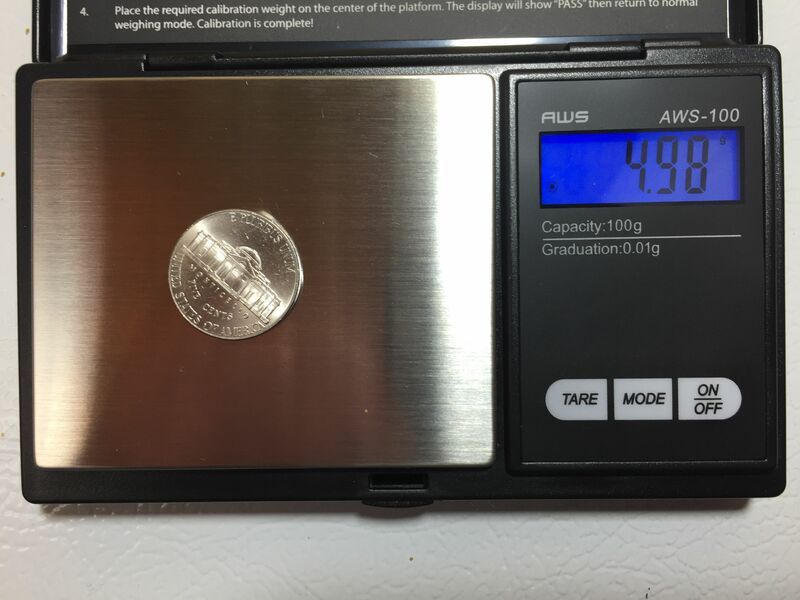 Notice that the scale reads 39.45 grams. A press of the Tare button effectively zeroes out the scale. Because the container is subtracted, I’m weighing just the contents. That means I have 35.22 grams of Amarillo hops here. 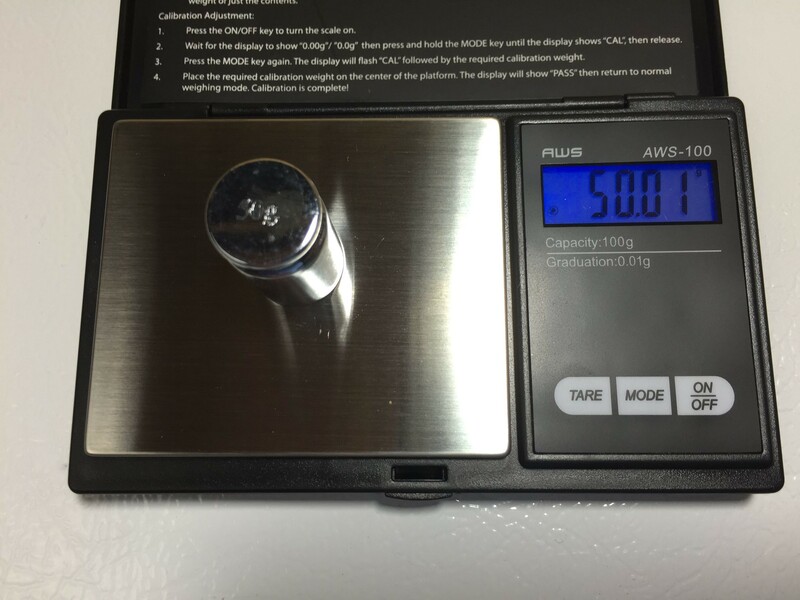 One thing I have wondered is… Can you weigh more than the capacity of a scale using the Tare Feature. The answer, at least for this scale, is yes. 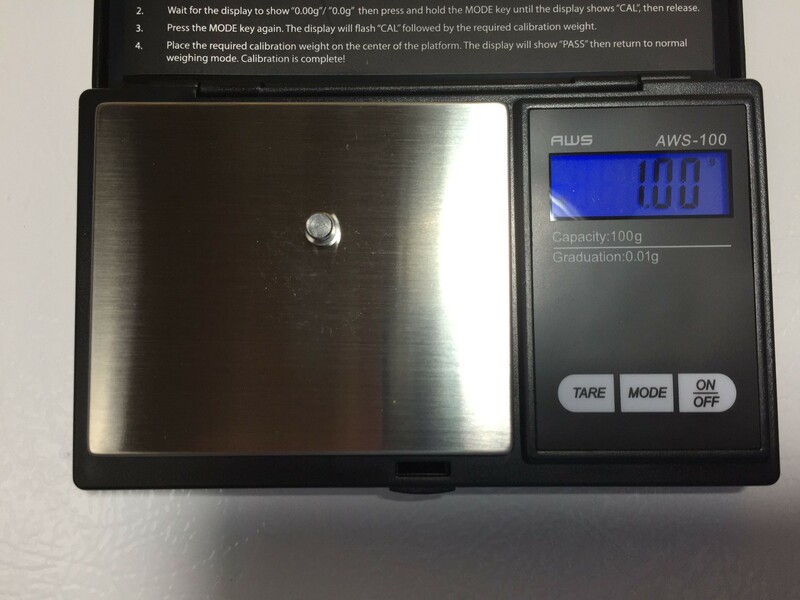 I put a 100 gram weight on the scale, Tared it and then put a 50 gram weight on the scale. I’ve owned this since December 2014. 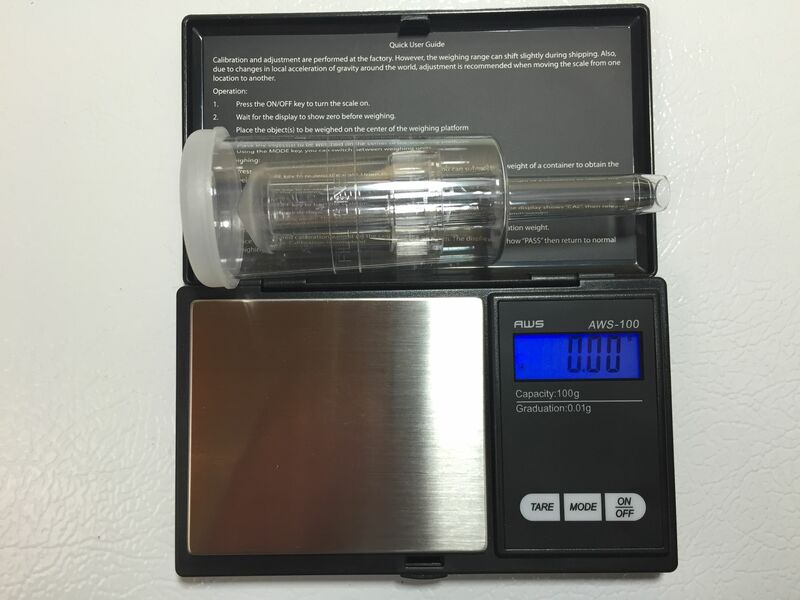 I can tell you that it is a great scale with excellent resolution and accuracy that is perfect for hops and water salts. This entry was posted in Amazon, Featured Reviews, HBF Tested, Hops, Reviews, Reviews & Top Posts, Scales, Water on December 23, 2014 by admin. I’ve had the 2kg version on my wishlist for a while, but at half the price, this is still perfect for hops and other things around the kitchen (coffee, etc). 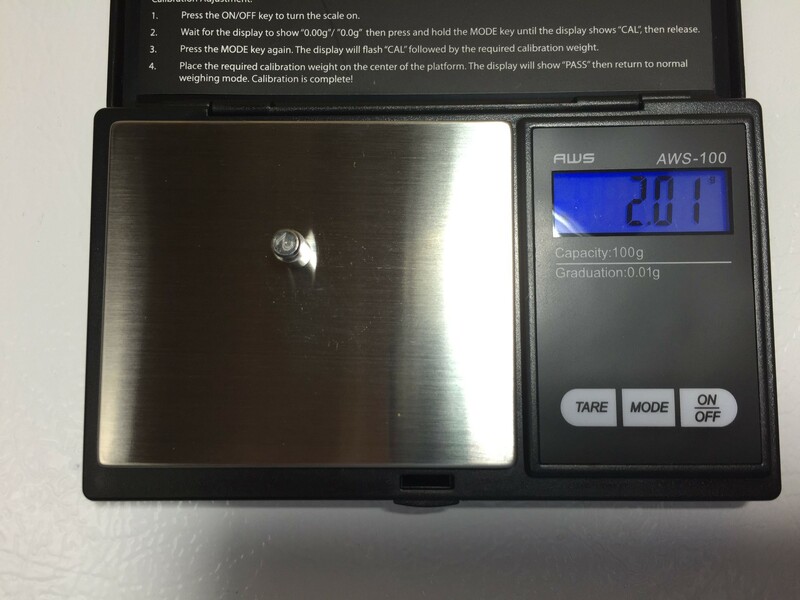 I do want a “full grain bill” scale, my current scales are ~6lb limits. Thanks for the support Adam! Of course, I can’t tell who buys what. 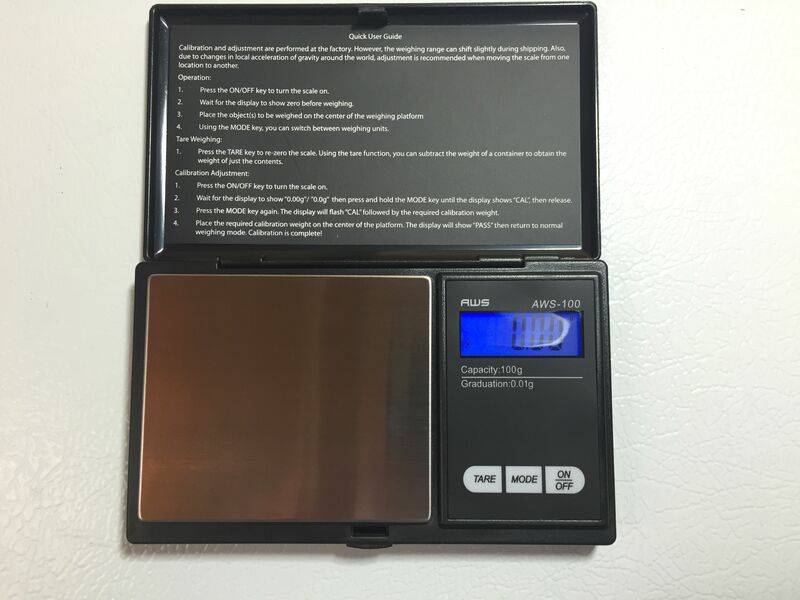 Check this out for a grain scale… http://www.homebrewfinds.com/2012/10/hands-on-with-ultraship-55-lb-scale.html They also make 35 and 75 lb versions. 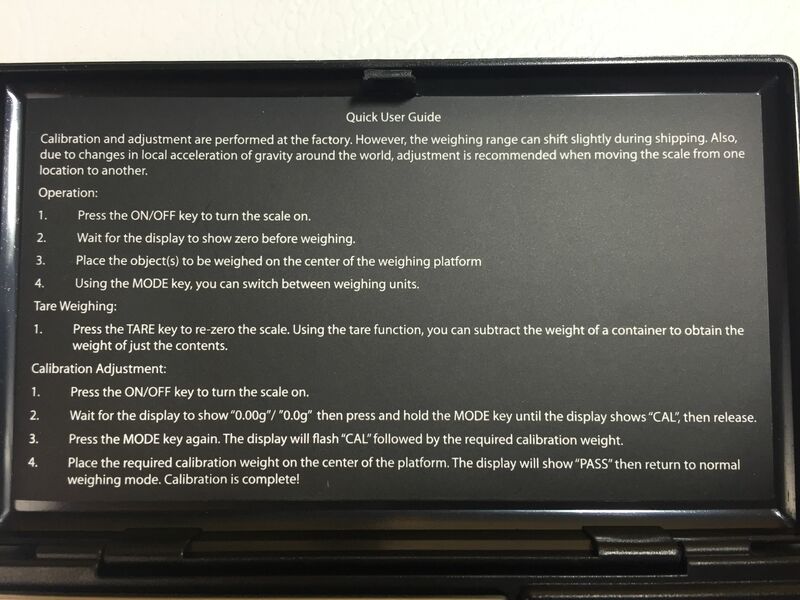 I also use this scale. It is a great value. If forms a nice complement to a scale that can weigh a full grain bill.